With two single-coil pickups and smooth feel, the Player Left-Handed Jazz Bass delivers elevated style and authentic Fender tone. It packs a growling voice that's matched with fast, smooth playing feel. Ready for action in the studio, or on the stage, the Player Left-Handed Jazz Bass can take anything you can think of-and everything you haven't yet. Two growling Player Series single-coil pickups are packed with legendary Fender bass tone, turned up to 11 for modern ears. Volume controls for each and a master tone control are close to hand to shape the pickups' powerful voice so you can easily craft your sound. The "Modern C"-shaped maple neck hosts a 9.5"-radius fingerboard with 20 medium-jumbo frets that are ideal for almost any playing style, while the 4-saddle bridge is engineered for accurate intonation and easy action adjustment so you can personalize the feel to your playing style and taste. 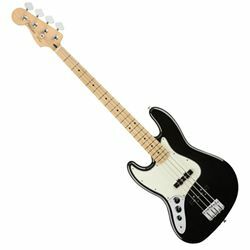 When you need a bass that can get you get to the next level, reach for the Player Jazz Bass Left-Handed.